As of 30th April, two of the island’s most prominent organic farms, Can Parades and Can Muson, are joining forces. ibiCASA took the opportunity to visit both parties to discuss their exciting upcoming collaboration. Toni Riera Tur of Can Parades, San Miguel, is Ibiza born and bred. It is the very land that surrounds the house he grew up in, and still occupies, that expanded from a modest family vegetable plot to the vast stretches of cultivated land he lovingly tends today. All his produce unequivocally meets organic standards; effectively meaning no use of fertilisers, pesticides, GMOs, or radiation. Originally embroiled in a career as a salesman, the notion of organic farming couldn’t have in fact been further from Toni’s mind. That was until his ex-wife, Karen, entered the frame, fresh from her homeland of America and carrying with her all its newfound excitement for organic produce. 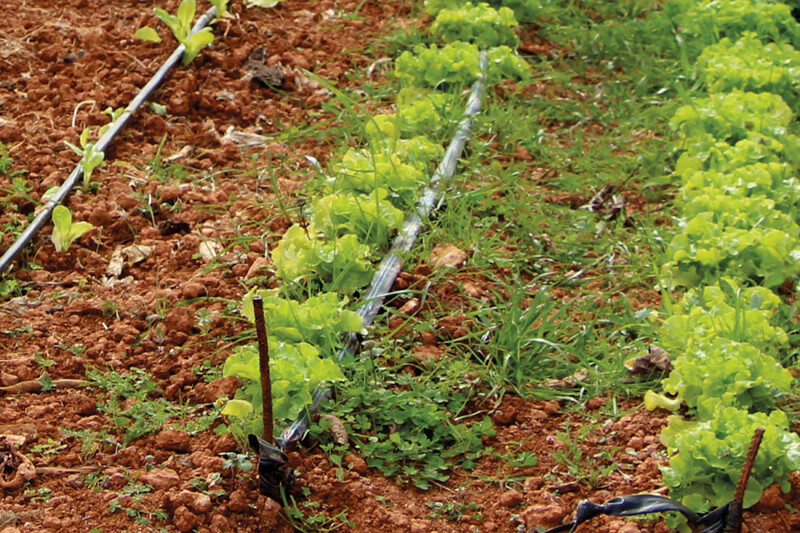 Toni was quick to embrace the concept too, and has been dedicated to organic farming ever since – catering to primarily international clients from all corners of the island. Ten years on, his treasured market days, on Tuesday and Saturday mornings, see a weekly average of around 100 people walk through his doors. As a result, he is known for his close affinity with his clients and savvy cooperative initiatives; including a very mutually beneficial investment scheme that invited clients to fund the purchase of chickens, vines and fruit trees, in return for free produce equalling over their investment. However Toni, who lives with his parents, partner, and two young children (two and five), has recently made a liberating decision to simplify his life, and dedicate more of his time to his family, not to mention his great passion for boating. “I’ve been working six days a week for 13 years. It’s time for me to prioritise my home life.” To do this, he will open the doors to his on-site shop for the last time on Tuesday 29th April. But, what’s to happen to his dedicated regular client base after that? Enter María Marí Colomar of Can Muson. Toni will be growing his fruit, salad and vegetables as zealously as ever, but delivering them to Maria for distribution and selling with the help of Karen at her side. His clients will be offered the same products, conditions and prices as before, along with enjoying access to many added bonuses, including Maria’s organic meat, cheese, jams, bread, biscuits, wine and Hierbas. As president of the island’s Association of Ecological Agriculture, and fully certified as an organic farmer (falling subject to stringent biannual inspections), there is no doubt that Maria is a fitting new host to Toni’s dedicated Can Parades following. Moreover, all of the organic meat she sells is of 100% Ibicenco origin and recognised as belonging to local ancestral varieties. This makes the meat far more flavoursome and healthy, whilst supporting and conserving local production. Much like Toni, Maria’s road to organic farming was an unexpected one too. Also born and bred on the island, she had for years been in interior decoration, with an outlet in Santa Eulalia. One fateful day, a man visiting her shop suggested that she joined him later that day for a course on growing organic vegetables. Uninterested in such things, she responded with total bewilderment: “Why on Earth would I do that? What’s in it for me?” His response was simple: “To listen.” She went home and meditated on his words, and realised that “to listen” seemed like a simple enough request, and certainly enough to rouse her curiosity. And so she found herself on the course later that day – a brief moment which was to change the course of the rest of her life. She was touched and moved by the people she met; they were calm and peaceful, and somehow so different to the clients she’d encountered for many years, who were always in a rush, and at times aggressively so. She left the course thinking: “Why not make a change in my life and be around this kind of people all of the time?” Soon after, she handed her business over to one of her three grown-up children, and dedicated her life to being at home, rearing animals and planting organic produce.